Designed for financial leaders, these 2 programs will show you how to structure, execute and drive successful M&A deals globally. Led by Thomas Kessler who has been instrumental in leading over US$20 billion of deal transactions worldwide. His successful transactions have been featured and used by Harvard Business School as HBS case studies. These two programs have also been independently certified and accredited by CPD, an internationally recognized certification board. If you are a CPA, CFA or ACCA charterholder, these CPD credits will count towards your Continuing Professional Education (CPE) requirements. In this 2-day intensive executive program, you will learn how to develop an end-to-end acquisition strategy for your organization – starting from identifying the right acquisition target to quantifying transaction synergies to structuring the deal to implementing a successful post merger integration strategy. You will learn how to shortlist a potential list of acquisition targets which complement your existing business, adopt the right valuation technique and finance the acquisition with the most cost effective instruments. At the end of the two-day program, you will take away the right acquisition strategy to successfully achieve your required synergies. In this three-day intensive program on M&A Financial Modeling, you will learn how to construct a full merger model that incorporates sophisticated M&A concepts. With hands-on and interactive exercises, you will learn how to establish the right valuation benchmark for your acquisition, model the financial impact of your transaction – including earnings, synergies and cash flow analysis. In addition, this program will explore the concepts on deal structuring, deal structures and sophisticated concepts on synergies by using largely successful synergies templates used by MNCs. Program Success: Both programs have been held successfully in major cities including Sydney, Singapore, London, Toronto, San Francisco, Frankfurt and Hong Kong over the past 2 years with over 300 financial leaders participating in these programs. 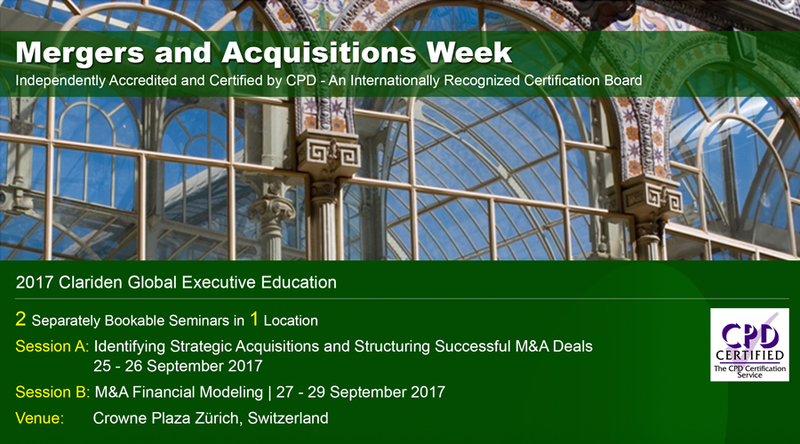 Establish Your M&A Capabilities: To help you establish the right M&A capabilities for your organization, I strongly encourage you to sign up for both back-to-back sessions as you will also be entitled to the 10% discount on the second program.